By Nick Rojas: There is nothing small about running a business. There are so many things that business owners need to consider, ranging from how to get their business to being successful, to finding the cheapest energy provider through someone like Simply Switch. Every entrepreneur could use a longer day with more free time and better organization — and that is precisely what 2015’s best small-business apps provide. Of course, no app can add hours to a day, but the year’s top applications help businesses owners automate whatever they can to increase efficiency through better planning and collaboration. Just like with the use of apps, there are also companies out there that many business can use the services of to help certain parts of their business to run a lot smoother. Just because you run your own business, this doesn’t mean that you can’t find a way of making it easier on yourself. We all know how stressful management can be, so why not take off some of the pressure and ask for some help! From managing your payroll process with companies like CloudPay, to growing traffic on your website through a specialist SEO company, there is a solution out there for any part of your business you aim to improve on. There are many businesses out there that are moving with the technological times and implementing the use of apps and devices, just to make running their business a lot easier. Every business will be different. For example, if you have an IT company or run an electrical service company, you should check out this service app for your business. No matter what industry you are in, you will eventually find a solution that will work perfectly, with the use of technology. For the traveling businessperson, Expensify can keep track of far-flung expenses and receipts. By linking credit and debit cards, Expensify can create detailed expense reports for every expenditure. This app can save time and prevent mistakes for traveling business people who have gotten used to keeping receipts or scanning them with third-party hardware devices. With Expensify, the user has the option of taking a picture of their receipts. From there, the app pulls and stores all of the relevant information automatically. Wave is a cloud-based accounting application that can help businesses keep track of income and expenses, manage payroll and create invoice templates. Receipt scanning, email support, accounting and reports are all free, and paid versions enable business owners to accept credit cards, pay their staffs and get expert help. Pushover can simplify and streamline day-to-day operations for the highly mobile entrepreneur who uses more than one phone. The app costs $4.99 a month, which includes 7,500 messages a month. The app functions on desktops and mobile, including iOS and Android. Not only does it organize all of your messages in one single space, but it sends push notifications to the phone of your choosing. Trello just might be the sleekest, most functional and most aesthetically pleasing of all the collaboration apps. Trade in spreadsheets and email threads for image-based, Pinterest-esque boards that can unite scattered employees, freelancers, clients and co-collaborators. 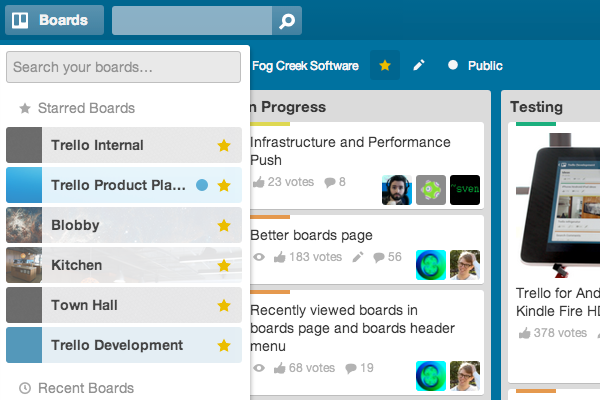 Every member of the team can add to the boards and modify the project. Lists keep track of workflow, and each project is catalogued with timestamped changes. The drag-and-drop format makes editing intuitive and simple. Mynd is more than a calendar, a planner or a to-do list. Its sole purpose is to get you to every meeting on time. No matter where your meetings are, Mynd can eliminate missed meetings and reduce late starts by recommending a good time for you to leave based on time of day and traffic. One of the app’s best features is that it connects to LinkedIn, so you can see who among your connections is attending the same meeting or event. Choose apps based not just on price, but on their ability to help you manage your time more efficiently. Any app that can automate tasks for you is an app that can recover lost time, which you can then invest back into your business.